By combing the scenic Manistee River Trail with a portion of the North Country Trail, hikers can enjoy a 23-mile, multi-day trek with backcountry campsites, ridge-top views of the Manistee River and even a waterfall … or two! One of Michigan’s newest trails, the 11-mile Manistee River Trail was completed in 1992 and linked to a rugged portion of the North Country by the largest wooden suspension bridge in the Lower Peninsula. 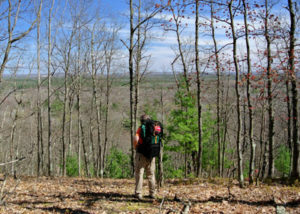 The two trails now offer backpackers an ideal loop that begins and ends at Seaton Creek National Forest Campground west of Cadillac and in between skirts an undeveloped, remote stretch of the Manistee River. The trek is a two- to three-day adventure where nights can be spent at walk-in campsites perched above Michigan’s third longest river or on top of ridges with sweeping views of the Manistee River valley below them. 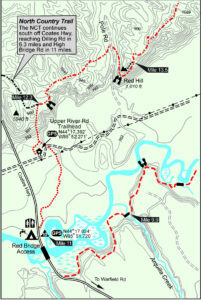 The Manistee River Trail Map is from MichiganTrailMaps.com, your trusted companion for accurate trail information. The large format map measures 11 by 17 inches, is printed on durable card stock and is coated to be water resistant. Included in the publication are the locations of all walk-in campsites, mileage flags, contour lines, even where the best viewing points are along the route along with trail notes. Best of all, when folded it fits in your back pocket or the side pouch of your pack.